No, this hasn’t become an Assassin’s Creed blog. This is my attempt at a short diary series which explores video games’ greatest mountains. Mountains have long gripped our imagination, and, reaching beyond the crests of any city, call to us with a primal urgency. Why do we climb them? How do we feel when we reach their lofty peaks? Perched atop a cathedral spire you survey city and sea. You’re so high even the birds are silent and you have only the whistle of the wind for company. Since its inception the Assassin’s Creed series has helped shift the focus of open worlds from the edges of the map to the apexes. These games are fixated on having you reach the top of the world. 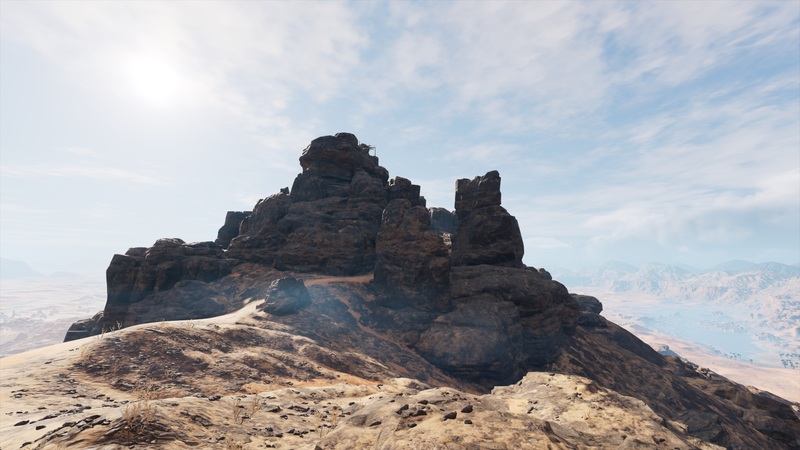 From these vantage points you are given opportunity to absorb the landscape, only to later jump down and devour the map one stronghold or collectible at a time. 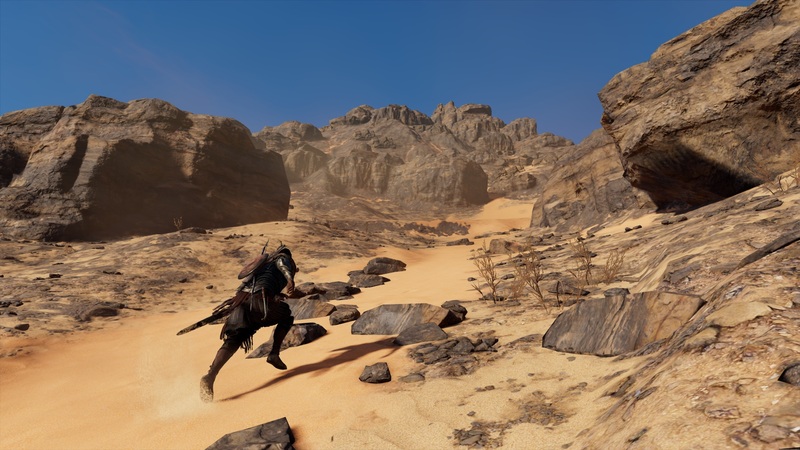 In the latest Assassin’s Creed, there are several territories that fall outside of the usual cycle of survey and consume. Away from the Great Pyramids and towers of Alexandria are Egypt’s lonely deserts. 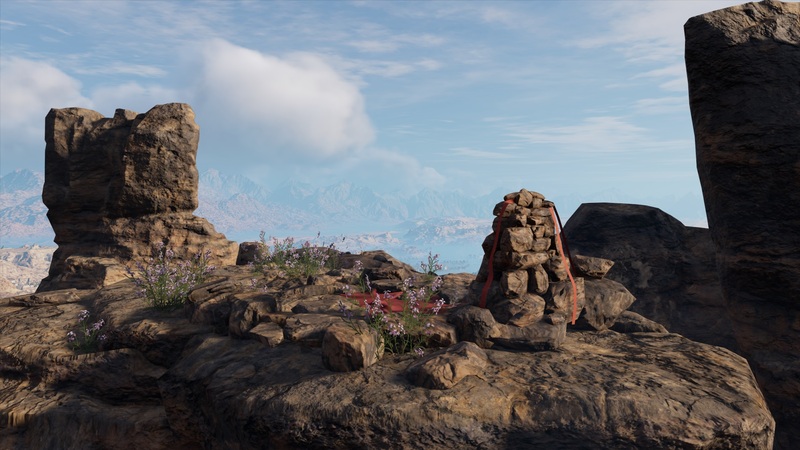 One such territory, the Black Desert, is home to the highest point on the map, and yet it is without icons save from one upon its contemplative summit. I set off from a small village besides Faiyum’s great lake. With my back to a caravanserai and the White Desert beyond, I began a trek towards the south side of the mountain. The land leading up to Ra Horahkty slowly rose from the lake, weakening the prominence of the range. There were two natural peaks, twins, with a high col joining them. Faded black rock was diminished slightly by veins of lighter sand. Craggy and squat, there was a gradual pass leading up to the mountain ridge. Below the mountain’s base, a stretch of sand acted as a natural moat. Several travellers passed by; two camels, several sheep and dog in tow. Beyond the sand-moat were ringed escarpments leading up to Ra Horahkty. Clambering up those rocks, there was the sense of a looming sandstorm, although the mountain would provide an elevated shelter from the low-roaming desert winds. As predicted, a gradual but rugged pass led up to the shoulder of the mountain. Save for some withered shrubs bereft of life the land was as bare and barren as the deserts below. There was a distant wind as I scrambled up to the ridge, and a sense that the land here was uncolonised. The peak of Ra Horahkty itself was a dark crown which jut out vertically from the body of the ridge. Not so uncolonised after all: a rickety scaffold frame assisted the climb. Furnishing the pinnacle were two cairns and a flag post, to which crimson strips of fabric clung and billowed in the breeze. Finally, a small rug was held down by rocks, atop which a bowl of incense burned gently. From Ra Horahkty’s Mountain top I could make out the Great Pyramids of Giza and the Nile striking out towards the sea. The peak was desolate but, weatherless and blue skied, not wholly untamed. The wild there was tempered. Away from the sprawling clutter of the lands below it became easier to pick out the path I had violently carved. I sat by the incense to meditate.